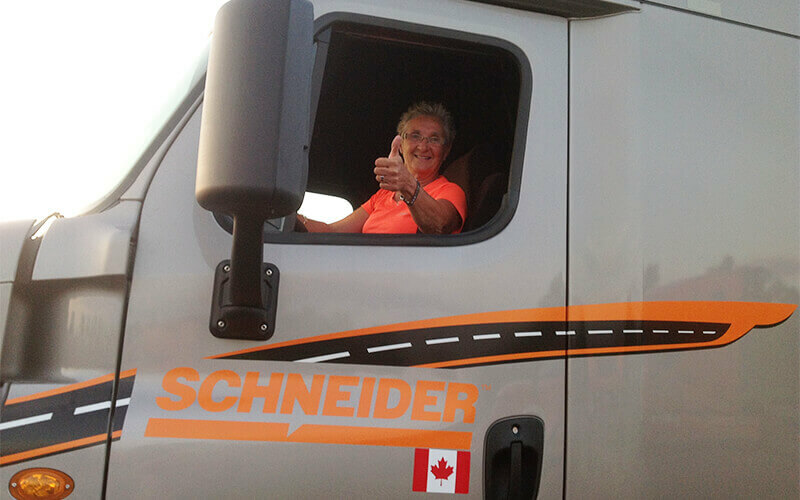 Schneider Canada Over-the-Road driver Lynn Lavallee is living the dream she never knew she had. She’s on an open-road adventure behind the wheel of a big rig. And to think she may have never become a driver at all, if a major career change hadn’t presented itself over a decade ago. Lynn had 20 years of office administration work under her belt before the changing economy led to downsizing in her office, including her position. As someone with a positive outlook on life, Lynn took the opportunity to break into something different and started to work in road construction. As she worked, she saw big trucks driving by and found herself wondering what it would be like to drive one herself. Inspired, it was then that she applied to driver school and earned her CDL in 2007. 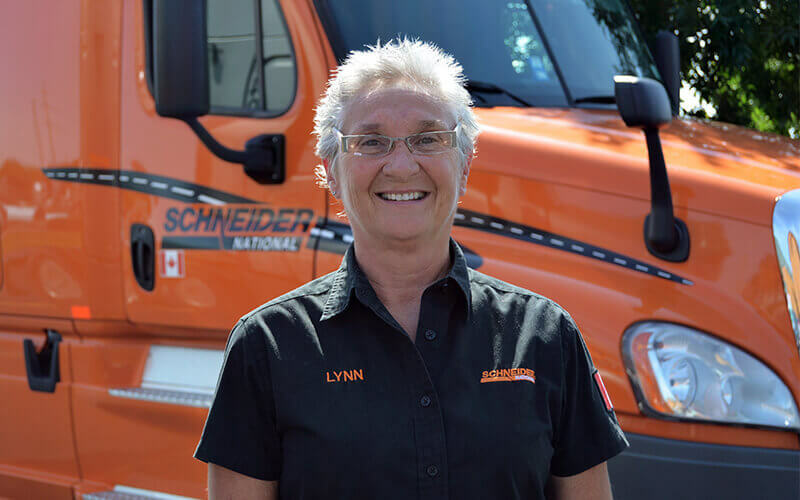 When faced with the decision of which company to drive for, Lynn was drawn to Schneider from the very beginning for its training program and reputation for safety. After 12 years driving Over-the-Road and her collection of road atlases at her side, Lynn continues to look to the future all while enjoying the scenery. That said, Lynn does often miss her mom, twin sister and nephew back home. In addition to loving what she does day in and day out, Lynn enjoys staying active both on the road and at home. She golfs in the summer and participates on a curling team during her home time. If she’s out on the road, she keeps her truck very clean and takes lots of walks wherever she goes. After a few bumps in the road, Lynn has course-corrected to a career she enjoys and looks to navigate her personal goals along the way. 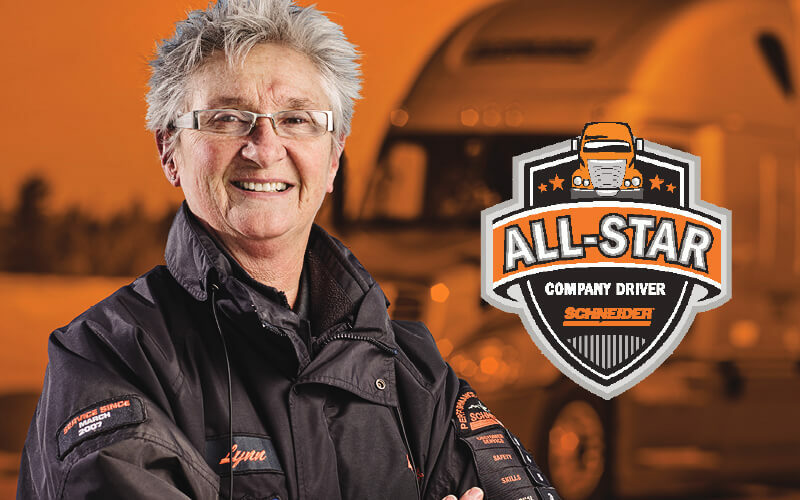 With over 900,000 miles as a Schneider driver thus far, Lynn hopes to become a Million Mile Driver and looks forward to retiring, but isn’t in a big hurry. We’re glad to hear it, Lynn. You’re an exceptional member of the Schneider team. Looking to start your next adventure? Check out Schneider’s driving options and find one that works with your lifestyle and career goals.